Breaking Bad’s Aaron Paul stops by the show. Cool interview . . .
My guess is that few, if any of us, remember the movie “Mac and Me.” A movie staring an alien that is separated from his family, searches for them, evades the government and dances in a McDonald’s, all with the aid of a child in a wheelchair (think “ET” but without being able to ride a bike). A post on Filmdrunk shows a clip from “Conan” where Paul Rudd plays a scene from “Mac and Me” instead of one from his movie “Role Models.” It has apparently been a rolling joke on the show, with Paul Rudd going straight to this scene from “Mac and Me,” forgoing the promotion of the film in which he’s starring. 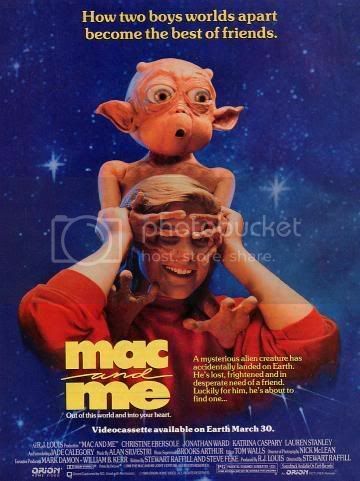 With all the shameless self-promotion done in the name of the golden arches, I’ve come up with a formula for “Mac and Me.” It goes something like this: Ronald McDonald + “Mac and Me” + McDonald’s dance party in “Mac and Me” = the greatest product placement movie in history. Gives new meaning to the phrase Mac attack.